Hmmm. I’m still on the fence on this one. I wanted to read something spooky in honor of Halloween, and this one fit the bill. It’s definitely spooky, creepy, and eerie. But . . . not completely satisfying. Captain Chip Linton is a commercial pilot flying regional jets. Shortly after takeoff during a fateful flight, his plane collides with a flock of geese which disables the plane. Captain Linton attempts a water landing on a lake, and manages to save the lives of nine people aboard, including himself. However, 39 people perish. In the aftermath, he is plagued by depression and PTSD, and ultimately he and his wife decide that a move might be the best medicine. And so Chip and his wife, Emily, and their twin daughters, buy an old house in rural New Hampshire, hoping to find healing and make a fresh start. The house, however, has a history. The house, it seems, is filled with malevolent forces. Chip begins to receive visits from three passengers who were violently and grotesquely killed on the fated flight he piloted – tormented by their ghosts who are making demands of him. Is he losing his mind, or are these spirits real? Meanwhile, the town is full greenhouses and women who are self-proclaimed “herbalists.” What are these women really up to? Why are they so interested in the Linton family – especially the young Linton twins? Some say the women are witches. Some say they found the fountain of youth in a tincture created years ago with the blood of a young twin boy – a boy who lived in the very house Chip Linton and his wife and own twins lived, and who died a mysterious and violent death. All in all, it’s a pretty good story, but it seemed like it did leave some loose ends (like, whatever happened to the psychologist’s body? ), and parts of the story seemed a little pointless. Like the errant lesbian scene. I mean, if you’re going to throw in a lesbian scene, let it have some bearing on the story, am I right? The story is extremely creepy and suspenseful. I found myself afraid to find out what was going to happen next, but having to know. Had it been a movie, I would have been watching through my parted fingers. Everything was good until the end, which just . . . sucked. Still, if you’re in the market for something ghostly and weird, this one’s worth a shot. I was just going over your blog to see if there was anything on here at my library befoer I head over to get a new audiobook and saw this. I LOVE Chris as a writer- I did not love this book. Have you read others by him? My faves are The Law of Similars, Midwife and Transister Radio. I also liked to a lesser degree- Skeletons at the Feast, The double bind. he’s up there as one of my favorites with Jane Hamilton, Barbara Kingsolver, A. Manette Ansay & Jodi Picoult…..sigh Off to pick up either The Expats or Prep on audio! The Midwife is one of my favorite books. 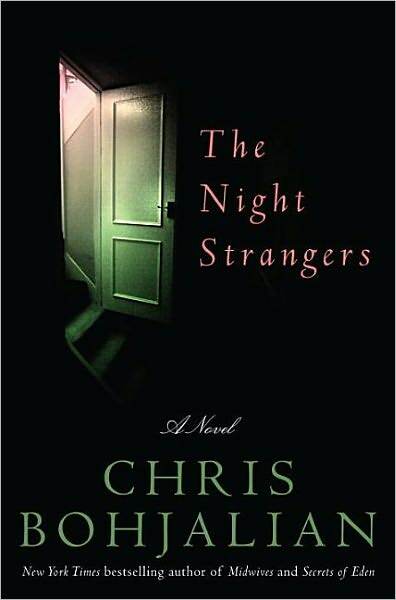 That and The Night Strangers are the only books by Chris Bohjalian I’ve read, although I know I have a couple more of his books unread on my shelf. Love love love Barbara Kingsolver’s The Poisonwood Bible and The Bean Trees. Ahhhh . . . so many good books! My favorite of Kingsolvers was Prodigal Summer- although Flight Behavior comes in a close second!